Is this an image of the first BlackBerry to run BBX? Whoa! Here we go. For the past little while we've been hearing plenty of code names floating around for the next generation of BlackBerry devices. The BlackBerry Colt of course, was one of the first ones, but there have been a few others. Milan, Lisban and more specifically, a device codenamed 'London' was suggested as being tested internally and that -- is what is purported to be shown above. When it comes to specs, it is said to be running a a TI OMAP dual-core CPU clocked to 1.5GHz, 1GB of RAM, 16GB of internal storage with an 8MP rear camera and a 2MP front facing camera. Looking at the device, it shows clear signs of the Porsche P'9981, but has a more toned down look to it. The information suggests it is boxier then the image would have you believe as it can stand straight up on one of its sides. While fun to look at, it's noted as being a dummy model which could explain the screen looking much less than bright and vivid, but clearly the intention here is to show it running on QNX / BBX. 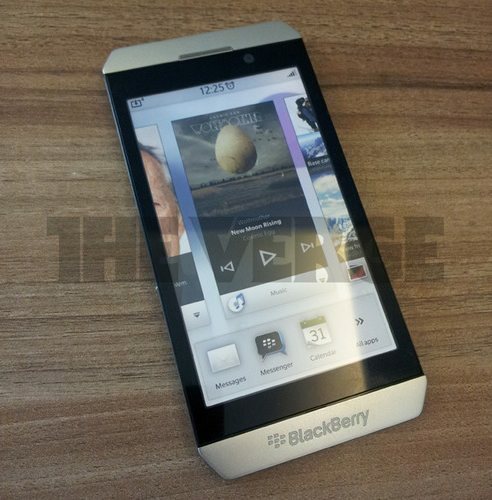 So, is this a next generation BlackBerry that will reach consumers' hands? Possibly another Porsche design or -- the remains of one? We're not sure. Either way, it's not as offensive to me as the P'9981 -- but what do you all think?